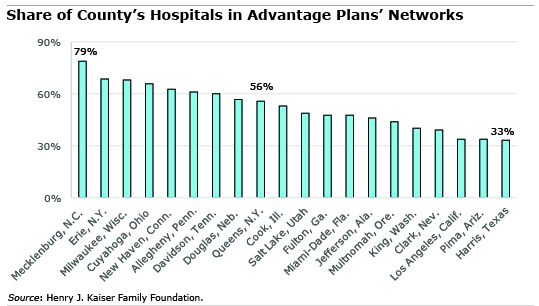 In the following nine counties, all of the Advantage plans had only small or medium-sized hospital networks and excluded at least one-third of the hospitals within their borders: Cook County; Clark County in Nevada (which surrounds Las Vegas); Davidson in Tennessee (Nashville); Harris in Texas (Houston); Jefferson in Alabama (Birmingham); King in Washington (Seattle); Pima in Arizona (Tucson); Los Angeles in California; and Salt Lake in Utah (Salt Lake City). There were big disparities in the share of a county’s hospitals included in that county’s plan networks, from 33 percent of Harris County hospitals to 79 percent of Mecklenburg County hospitals (Charlotte, North Carolina). The vast majority of Advantage plans had access to an academic medical center either in the county or in an adjacent county. Access to National Cancer Institute (NCI) cancer centers was more limited. Of the 20 counties studied, 15 had NCI centers within their borders. But 84 percent of the Advantage plans in these counties did not list the NCI cancer center in their provider network. It can also be difficult to ascertain whether other specialty care facilities affiliated with a hospital listed in an Advantage plan network, such as heart, rehabilitation, or women’s care centers, are covered as part of a plan’s provider network. HMOs tend to have narrower hospital networks than preferred provider organizations, or PPOs, Kaiser said. But there’s no evidence premiums are affected by whether an HMO or PPO plan has a broad or narrow network. To read a blog that explained the pros and cons of Advantage versus Medigap plans, click here. To find a State Health Insurance Assistance Program that provides free counselors and help navigating the Medicare maze in your state, click here. That is the way many — if not all — managed care health plans work…whether you are on Medicare or getting insurance from an employer or buying it yourself (through Obamacare or at full price). There is nothing here unique to Part C of Medicare. What are these researchers trying to investigate in their research: whether HMOs and PPOs work the way they should? As an insurance agent for 35 years, I refuse to sell these plans for many reasons. No or very little premium sounds great until you need to use them and then you find out why I don’t like them. Co-insurances, deductibles and total out-of-pocket expenses are greater then just paying the premium for traditional Medicare with the supplement. Medicare part B premiums are paid by seniors regardless. In case someone is wondering, I do practice what I sell. I assume the math differs everywhere in the country because the private Medigap supplements that you sell are regulated by the states. In Massachusetts, where I live, the combo of Part B and the private Medigap supplement you are selling seniors (plus Part D because a Medigap supplement does not cover self-administered drugs) costs about $2,500 a year more than an equivalent public Part C plan on top of B, even after the typical co-pays. And the Massachusetts Part C plans cover annual physical exams and typically vision testing and/or hearing aids partially, among the many medical services that Medigap plans do not cover at all. Most important of course, public Part C health plans include an annual out of pocket spend limit, something you cannot buy through a private insurer in Massachusetts and the major thing that Medicare lacks. But every state is different. Maybe you are giving the seniors in your state good advice. I am a satisfied Kaiser Medicare Advantage patient. When I moved back to California, from North Carolina, I realized the cost savings cited in the article, i.e, combined cost of Medicare C was substantially less than my Medicare supplement and Medicare D premium. I value the excellent care I receive from Kaiser and the simplicity of essentially having a single payer health insurance. I know that insurance companies try to seduce you into small co-pays and low premiums. More and more doctors are opting out of those plans and many services are not covered. If you have straight Medicare with a regular secondary such as BCBS or AARP (NOT HMO) you can see any doctor. If he/she does not accept Medicare, at least you can submit his bill and get some of your $ back.